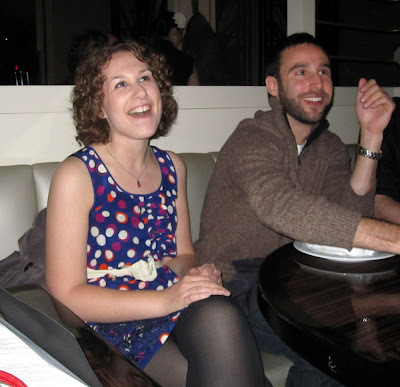 I'm Back and Birthdayed with Mark Peel! My sister Beth, Mark Peel, and me! I just returned from two amazing weeks in Israel (and I'll have more to say about that in upcoming posts). The last day of my trip was spent in Jerusalem, and it was also my birthday. Pretty special to celebrate the day in the Holy Land. This weekend, back in Los Angeles, I got together with friends for a little belated birthday bash at The Tar Pit, chef-restaurant mastermind Mark Peel's latest endeavor, and wow, my first impression was great! The vibe was cool and classy. Giant glass chandeliers, mirrored walls, and beautiful and comfy armchair seating. The drinks were fantastic and I thoroughly enjoyed my mint cucumber cocktail. delivering a dessert plate and birthday candle to our table! I saw a man walk through the restaurant in a white chef coat and I immediately knew who it was. I stretched my arm and pointed him out to my friends. My friends tried to stop me from pointing, thinking I was identifying (and outing) some incognito celebrity who had just walked in. 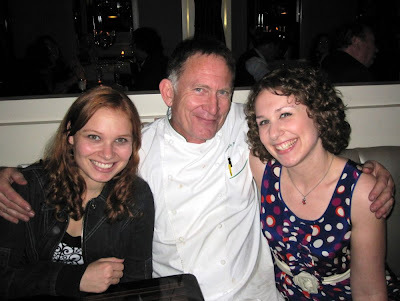 I explained to them that this man was the chef-owner. When they realized the level of excitement on my face, they encouraged me to go up to him and say hi. This wouldn't be the first time I'd met the man. He was a judge at the KCRW Good Food Pie Contest where I took home first place in the Creams category. So I got out of my seat and ran up to Mark Peel and said to him I wanted to re-introduce myself. He was so friendly! I told him it was my birthday party and he wanted to know where we were seated, what we were drinking, what we were eating, and if we were having a good time. Then he came over to our table to say hi to the gang. 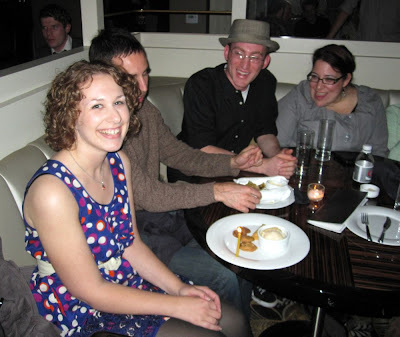 He told them I was Queen of Cream Pies, which made me blush. I couldn't believe I was chatting with Mark Peel. Then he went off to the kitchen. 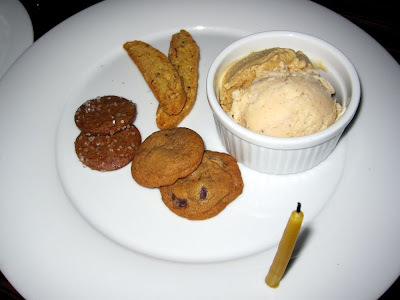 A few minutes later, he came back out with a yummy dessert plate of banana and coffee ice creams, an assortment of mini cookies, and a lit candle. He placed the plate in front of me, sang happy birthday, and sat down beside me. I made a wish and then got a photo with him. He stayed to chat for a few more minutes. Ain't life sweet! The delicious dessert plate. Thank you, Mark Peel! Mark, if you're reading this, you are a gracious host. Thanks for putting my birthday celebration over the top! 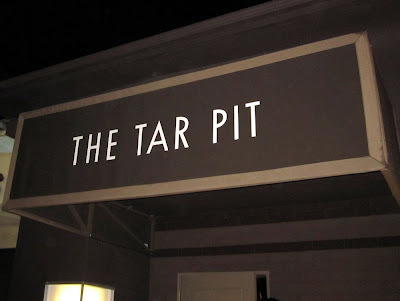 I will definitely be returning to The Tar Pit; I have unfinished business there, needing to try the dinner menu and other delicious-sounding cocktails. Your descriptions made me feel like I was there! What a memorable birthday celebration!! !Love the candid pictures! Happy Birthday! Wow, you had a incredible celebration -- great food, killer dessert platter and warm greetings from a famous chef. Sounds like one unforgettable evening. And you deserved every magical moment of it. what a great birthday! and what a cool guy. glad it was a good time!